During yesterday’s Q3 2018 financial call, CD Projekt RED CEO Adam Kiciński talked about Cyberpunk 2077. 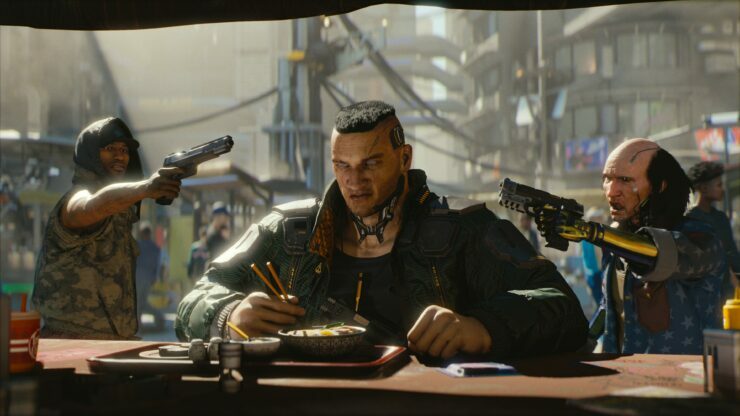 The English transcript, available now at this address, shows him mentioning the great interest in Cyberpunk 2077 registered by the trailers released this year. In fact, according to him, it’s ‘many times’ greater than The Witcher by the same metric. We are comparing apples and apples here: you are witnessing the activity on our own YouTube channel in the first four post-release weeks. The six yellow bars on the left represent six of our most popular videos promoting The Witcher 3, published between the game’s announcement and ultimate release. The two bluish bars on the right correspond to the two initial – well, maybe not initial since the first-ever Cyberpunk 2077 trailer was released some years ago – but this year we released two new trailers showcasing our upcoming release. The first of those appeared at the end of the second quarter, while the 48-minute gameplay trailer was released this August. As you can see, interest in Cyberpunk 2077, or at least in its trailers, is many times greater than in the case of The Witcher. Of course I do not encourage you to draw far-reaching conclusions; however at this early stage of the campaign the most important question from our perspective was whether Cyberpunk – the new IP we’re introducing to the market – will take hold, whether it will be as well received as we would expect, at least in terms of attracting gamer interest. These viewership figures answer our initial question in the positive: gamers are indeed interested in Cyberpunk 2077 and are eagerly awaiting its release. Of course, the bulk of the campaign still lies ahead. This is merely the beginning; the game has to be completed and there’s a lot of development work in store. We are, however, convinced, that this product has the potential to meet our expectations. In the Q&A section of the call, Kiciński also addressed the Gamescom 2018 news that the campaign was fully playable even back then. It was true, it turns out, though as expected a large part of the game wasn’t as detailed as the one showcased by the Polish studio. Overall, Kiciński said that the development is progressing fast, according to plan, although there will be the ‘hugely important’ phase of polishing at the end and they’re making sure to set aside time for it. We are fleshing out the game world. The comment regarding the game ’s campaign, yes, it was true at the time it appeared, however not all of the game looked like the fragments showcased at E3 and gamescom; a large part was not quite as detailed. We are filling the world with content and tweaking things, and this involves a great deal of hard work on the part of developers. What I can say today is that we’re progressing fast and according to plan. When we finish, there’s also the hugely important phase of polishing all that game content. There was a question about the quality of the game we plan to deliver at launch and our intention is to deliver something of great quality. Once the game is complete, we can begin to patch various bugs, both major and minor, and we are setting aside time to complete this process. Lastly, Kiciński was asked about the recent success enjoyed by Rockstar’s Red Dead Redemption 2. He replied that CDPR strives to make games as refined as Red Dead Redemption 2 and they are happy to see excellent games doing well on the market.